Mechanical Ventilation with Heat Recovery systems are actually very straightforward to install yourself, as long as you’re reasonably handy with a drill and you aren’t afraid of heights. Here’s a step-by-step process for how to install your own MVHR or HRV system, safely, without leaks and saving a lot of money. 1) Get a good MVHR design from the experts. The ducts around the unit are the thickest, so plan ahead and leave lots of space about the MVHR unit itself. If you use a radial design, the two manifolds are placed above the unit, and they are huge. Run the ducting between the rafters or in the wall studs, ideally. It’s good news if you have a suspended ceiling to play around with, too! In a small flat or home, the ducts will be at most 125mm diameter. In a large home they’ll initially be up to 200mm, then branching off to 125mm or 100mm diameter. 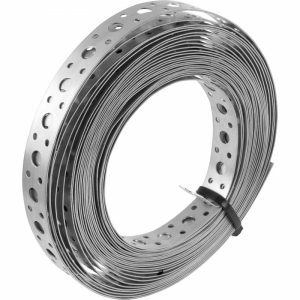 If you choose a radial design they will be 75mm or 90mm diameter – but remember you will need a duct for each valve in a radial MVHR design, so it can take up more space if you have a lot of rooms compared to a branch design. In a radial design, you don’t need attenuators. In a branch design, you do. A good design (by a reputable company) will work out exactly where you need attenuators to keep noise to a minimum. Sound attenuators are thick drums, and they can be twice the size of the ducting, so it’s important they fit right in your design. Find locations for the room valves where bulky furniture won’t block them in the future. In front of windows is a good bet, because you’ll never shove a big wardrobe in front of a window, will you? Make sure your design doesn’t have lots of twists or turns. Lots of bends in a ventilation system will create excess air resistance, and this will increase the fan duty – which means more money to run and more noise. Watch out for structural beams – you can’t notch a steel I-joist like you can do with wall studs or ceiling joists, so you’ll have to go around anything structurally important. Make sure all of the ceiling areas and walls you want to put the ducting are exposed. 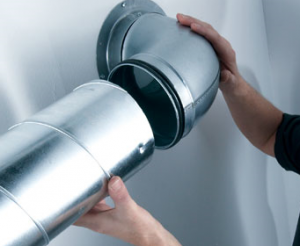 Purchase all of your ducting from a reputable supplier – don’t be tempted to buy cheap. 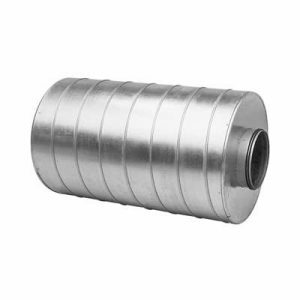 Lots of suppliers will sell you spiral rigid steel ducting (as used in industry) but you need it to be rubber-sealed. This will reduce the likelihood of air leaks when you join the ducting. Lay all of your ducting out. Use an angle grinder to cut it to size on the ground before you raise it in the air. Smooth down the cut edges. You can lay the ducting before you put in the MVHR unit – months in advance if you’re doing other renovation work. Clean all of the ducting inside and out, as it can be quite mucky inside. Use a garden hose and wash away the dirt and steel filings. If you don’t do this your MVHR filter will be clogged as soon as you start up the unit. Use metal strap-banding to support your ducting to the joists or wall studs. You don’t have to use a lot – one strap band per bend or 1m length will suffice. Drill one end of the strap band into the stud or joist, put up the ducting (this might require two people) and drill the other end of the strap band. You want it tight. If ducting is tight to a wall/floorboard, consider putting a length of foam between the duct and the wall or board. This will stop any vibrations through the duct system. 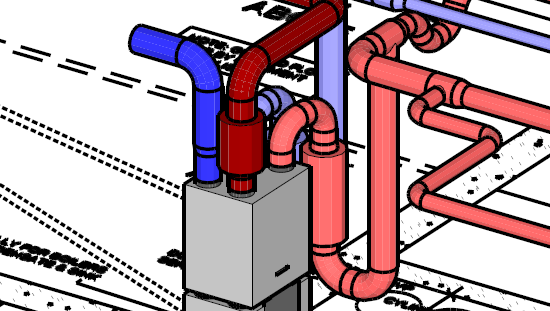 A good design will have considered the ducting around the MVHR system itself. 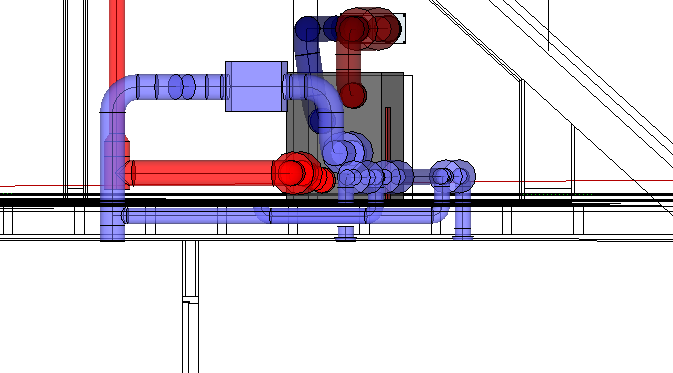 This is normally the most complicated part to connect, as there are four large diameter ducts all going in different directions (one intake from outside, one exhaust to outside, one extract from the house, one supply to the house). 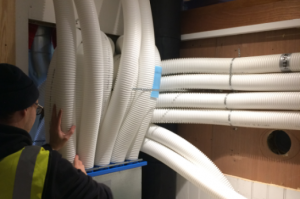 Take care when you connect all of this ducting. Consider the two air ducts to and from outside. You need an intake and an exhaust, and they can be anything from 125 to 200mm diameter each. They should be approximately 2m apart so they don’t contaminate each other, but if you don’t have the space you can use a combined grille. 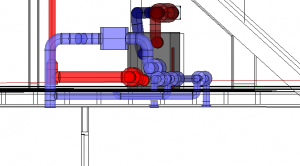 The simplest ducting is through a wall, but you can also go through the roof. Consider your MVHR unit carefully. You need a quiet one, and it’s worth paying the extra money for it. Don’t just agree with what your builder / contractor / plumber wants to throw in, especially if they say the word “Nuaire”. Consider that this unit will be on CONSTANTLY, so you need one that promises to be almost silent, or at least whisper quiet. 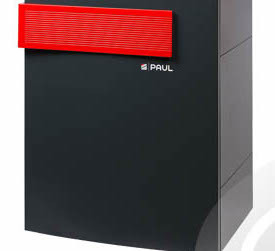 Buy a Passivhaus-accredited MVHR unit to be sure from a reputable supplier. Hopefully, you’re all there, and you and your family have clean, filtered and warm air all through winter – without ever opening a window. Any questions you might want to ask an accredited installer of MVHR and HRV systems, go right ahead in the comments below and I’ll answer! Do you do designs? If not who would you recommend? 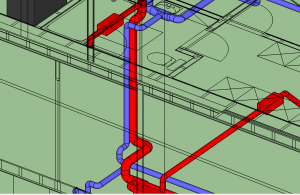 Hi Alan, yes we do detailed ductwork designs for MVHR systems. I will email you from my company address and we can discuss more. can I have your email, please? Hi Daniel, I sent you an email through my Enhabit email address, did you receive it?